A football club's home for more than 100 years will be turned into a new housing development. The site of Kettering Town's former stadium in Rockingham Road will see 49 new homes built after councillors approved plans. 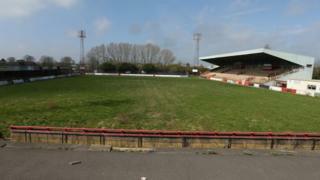 The Poppies played at the ground between 1897 and 2011, and moved when their lease ran out. The stadium was the club's home during Paul Gascoigne's 39-day spell as manager in 2005. Fans had long hoped to return to their former ground, but the stadium was demolished in 2017. Kettering Town, currently top of the Evo-Stik Southern Premier Central league, now play in Burton Latimer and recently bought a site in the Scott Road area of Kettering. The outline plan from Harpur Developments is for different sized houses and a small play area, the Local Democracy Reporting Service reported. The company will pay £11,000 per home in planning contributions. Kettering borough councillor Conservative Lesley Thurland said: "We all know the history of this site and it is a real shame that we are sitting here. "But when I think about what it could be and what the other options are I think I am quite pleased with the outcome after all these years." Labour councillor Linda Adams raised concerns at how many homes were being built on the site, and nine objections were received from residents. The highways authority said the plans did not fully meet highway standards and requested a new toucan crossing. The proposals will need to go back before councillors for full planning permission.